My Story with Bipolar Disorder Divided Part One: Dealing with depression for the First time. I have written a brief story about my battle with my mental illness, but have decided to elaborate on it and break it down to focus on small parts of my life at a time. 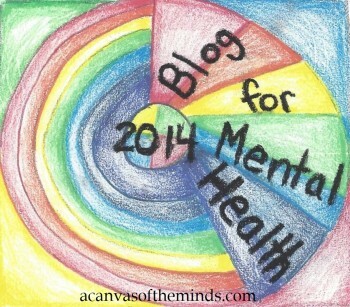 I hope that by writing these particular blogs I can help at least someone else by letting them know they are not alone. I am going to start with when I first showing signs of my mental illness. I had a happy childhood. My family took several vacations, played games together, and were very close. I don’t remember the day I first felt depressed. I do know it was when I was thirteen. However, I do know that at some point that I started crying for no reason, couldn’t concentrate on anything and just felt like everything in my world was awful. I remember going to school and crying through class. I knew the other kids were noticing and gathered they laughed about me after class. I was a very good student. However, due to my lack of concentration, I could not focus on what the teacher had to say. While doing my homework, I would read the same sentence over and over again and could not comprehend it. Thank goodness my mom tried to understand what I was going through. She is kind, compassionate person and would listen to me as I sobbed constantly. There was no reason why I crying. Eventually, my parents realized that sending me to school didn’t make sense. My mom went to the school and talk to my teachers. I was then allowed to miss school. My mom would go get my work and I would attempt to do it. It would take me ten times as long that it would if I was not depressed if not longer. Since I was not going to school, my mom would give me chores to do at home. However, even vacuuming up the stairs I could not do because I just couldn’t concentrate and just kept crying uncontrollably. I would not enjoy things I normally would. I wouldn’t want to watch tv with my family because it meant that it was close to bedtime. That meant often that I would have a difficult night sleeping through the night. Often times, one of my parents would sleep with me like they did when I was a kid. It was also another day wasted. My mom told me that the teachers really did not understand. They were what I would call clueless to what depression was and is. I was embarrassed as I was now known as a student with depression. Up until I started getting depressed, I felt like people who suffer from depression are weak, crazy individuals who could just snap out of it. I now was one of those people. 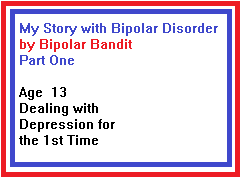 This entry was posted in Uncategorized and tagged bipolar, bipolar disorder, bipolar disorder story, depression, mania, manic, story about depression. Bookmark the permalink. Thank you for your honesty and courage. You are an inspiration.